Temporary traffic control isn’t something to be taken lightly. The safety of the general public and the contractors performing critical infrastructure projects require safe, quality work zones set up by trained traffic control professionals. The very nature of temporary traffic control work is full of risk, and the increasing number of distracted drivers on roadways have only increased those risks. It takes a true Safety-Driven passion to make a difference in the level of work zone safety and our mission to share that passion with others starts with people we hire and train. Our traffic control experts have all completed training courses from the Flagger Force Academy, our unique and thorough safety and quality program. 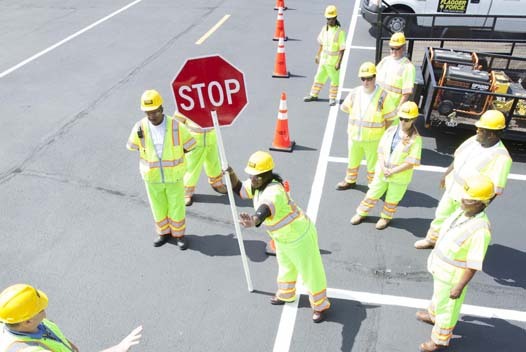 We created the Flagger Force Academy after seeing the need for standardized and consistent safety training for traffic control professionals. Trained traffic control flaggers not only know to apply the rules and guidelines established for the work zone in question, but are also trained to think on their feet and pay attention to traffic situations as they evolve and react accordingly. When creating a temporary traffic control work zone, Flagger Force utilizes the correct standard to keep you safe and motorists moving as efficiently as possible. We treat each work zone as a unique opportunity to share our traffic safety knowledge and experience. Every member of our Flagger Force team working on your site remains in close contact with each other and your site personnel to stay on top of evolving traffic situations. We use verbal (radio) and nonverbal (hand signals) communication with you and the traveling public. Traffic control should never be an afterthought. That is why we turned temporary traffic control from a casual occupation into a profession. Many states and organizations partner with Flagger Force to discuss traffic control and coordination guidelines, thanks to our years of experience and authority on the subject. If your highway project, in-town work site, or event requires temporary traffic control, trust the experts. Don’t leave safety up to chance by putting poorly trained individuals in charge of your traffic control needs. We work hard every single day to provide the professional traffic control training required for the safe, efficient management of traffic through work zones. We can train members of your team to follow the same safety protocols and practices as our own Flagger Force employees. Flagger Force Academy provides safety and quality training to all of our employees and that same training for flaggers can be provided to you and your staff. We invite you to contact our team and tell us about your temporary traffic control training needs. We’ll sit down and discuss your project and expectations. We can then discuss and provide a flagman training course that gets your crew the necessary knowledge for the job. Safety doesn’t happen by accident. It takes planning and organization to ensure traffic flow in temporary work areas is controlled properly. Trust our experience and our dedicated training course to augment the traffic-control safety for your next project.